People increasingly use search engines to find products and services they want. Hence, to have your presence over the internet by launching your own website is not enough. When someone searches for the products or services that you offer, your organisation should be shown on the first page(s) on the search engine. Considering millions of sites online and thousands of more being added daily, to get your website noticed, it must be accessible from as many access points as possible. And a high search engine ranking drives customers to your site. 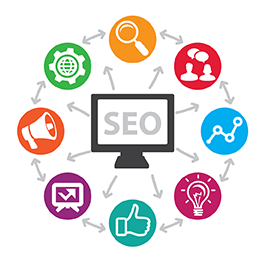 The objective of search engine optimization is to generate targeted traffic from those people you want to be visited by ranking high in the results of searches using the most appropriate keywords describing the content of your site. Amtech search engine optimization (SEO) experts guarantees your organizations name will feature in the top page in all the search engines. This will ensure more traffic to your site thereby increasing your business multi fold. Knowing how search engines work and how they can be harnessed to make your business more visible online, we will help you to reach your target audience quickly. Contact us for your SEO needs.